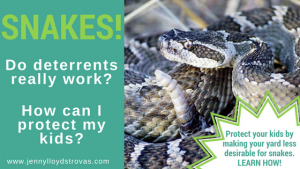 Snake deterrents don't work but there are other things you can do! SNAKES! Do Deterrents Really Work? How Can I Protect My Kids? 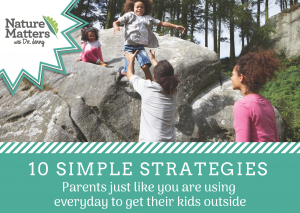 The weather is beautiful and your kids are playing outside daily. Guess who’s also enjoying the warm weather? You guessed it. Snakes. Snakes are not inherently bad. In fact, they do a lot of great things for us without us evening knowing! They provide free pest control services and are an important link in the food chain of ecosystems (they eat consumers and are eaten as well) maintaining biodiversity. However, when it comes to our kids and the possibility of being bitten, I understand your concern! I have two fearless boys who are fascinated with all creatures. We’ve taught my 5 year old to never touch a snake and to always tell us if he sees one. But at 18 months, my other son is clueless and I have to keep an eye on him. 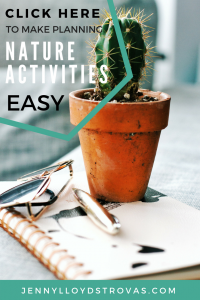 With the potential dangers of kids running into snakes outdoors, I wanted to dispel a few myths and give you strategies to decrease snakes around your home that actually work. Do snake repellent/deterrent products actually work? According to research, snake deterrent products do not work. This has been shown both in the lab as well as in natural environments. This is not suggesting that these chemicals won’t harm the snake. These results are suggesting that the payoff (a nice juicy rat or access to good habitat) is worth the cost of crossing any type of chemical barrier. Personally, I would strongly argue against using snake repellents around your home. First, the research suggests that they don’t really work. Second, these products are made of chemicals that are toxic for your children. A snake may just slither across it and experience slight discomfort. Your child could roll in it or put the chemicals directly in their mouths. The key to minimizing the risk of your child coming into contact with a snake around your home is to make it so that your yard is not a good habitat for snakes. A habitat can simply be described as an animal’s home. When we are looking at an animal’s home, we want to pay close attention to the physical as well as the biological features. For example, where does the animal take shelter? Where does it find food and water? What does it eat and is there food nearby? What predators in the area might eat the snake? Can it easily find protection from predators? Are there other individuals it can mate with? What does snake habitat look like? Good snake habitat has lots of places for snakes to hide. These cool, shady places help them regulate their body temperature as well as hide from predators. Good habitat also provides snakes with plenty of food. Although different species’ diets vary, it’s safe to say that if you can control the rodent population around your home, you will make the habitat less desirable for snakes that are venomous. How to deter snakes by managing their habitat around your yard and Home. Click on the photo to download the PDF. Plug up any holes! If you have holes in your house, fix them. If you have a mortared rock wall that’s becoming weathered, add mortar to the holes. If you see a hole under a sidewalk, plug it up. If you have a stacked rock wall with plenty of spaces between the rocks, you may want to consider changing it or adding mortar. Any places that provide access to a cool area should be fixed. These access points are great habitat for snakes because they provide them with shelter, protection, and a food source (guess who also likes to live in these places – rodents!). Cut back vegetation. If you have grass, keep it mowed. Tall grass provides a great way for snakes to move from one place to another without being preyed upon by larger animals. You should also consider cutting back your garden. By trimming low branches and pruning your plants (so there’s space between them), you’re taking away the snake’s ability to hide. If they can’t hide, they won’t feel safe and they’ll move to another area. Remove junk and brush piles from your property. Stacks of trimmed branches or piles of junk provide great habitat for snakes. It’s like living in an all-inclusive resort because rodents love to live in these places too. Snakes get shelter, protection, and a buffet! Pick up your kids’ toys. At the end of the day, we’re all tired and picking up toys outside is the last thing we want to do. I get it. But, if leaving toys out is a habit for you, then it’s likely that you have toys sitting outside that have been in the same spot since last fall. Am I right? (Ha!) These areas are especially dangerous for kids because a snake will take up residence in an old sandbox that’s never used thinking it’s safe. A year later, your kids decide to play in it and you have a snake encounter. Get your kids to pick up their outdoor toys at the end of each day and put them inside or in an outdoor trunk that is completely sealed. This will keep snakes from surprising your kiddos when they finally decide to play with the overturned dump truck that’s been sitting in the backyard for months. Control rodent populations around your home. If you know you have a rodent issue, take steps to control it – hire an exterminator or start trapping them. Not only do rodents attract snakes to your yard, but they carry diseases that could potentially harm your children. If you have any other questions about snakes, just let me know! Larry Clark and John Shivik. (2002). Aerosolized essential oils and individual natural product compounds as brown treesnake repellents. Pest Management Science. 58:775-783. **Although this study is interesting, please don’t try to use essential oils to deter snakes. Remember, if the chemicals can hurt a snake, then they may hurt your child as well. Dennis Ferrero. (1995). The efficacy of naphthalene and sulfur repellents to cause avoidance behavior in the Plains Garter Snake.Great Plains Wildlife Damage Control Workshop Proceedings. 432. Shmuel Moran, Svetlana Vaisman, Edi Tayar. (2008). The efficacy of a naphthalene and sulfur formulation to repel the venomous snake Vipera palaestinae in Israel. Applied Herpetology. 5:225-232.